Thank’s for the Memories LT! My Favorite Charger of ALL TIME! 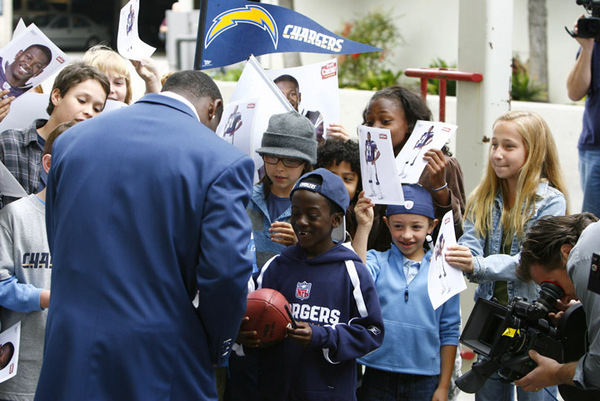 In case you have not heard, Ladainian Tomlinson was released by the San Diego Chargers today. It saddens me to see him go, but in the end, I truly think it is time for the Chargers and LT to part ways. By no means do I think LT is done. He had career lows in yards and TD’s, but he also had career lows in carries on top of missing two games. I am not saying he’s the LT of old, we all know he’s not, but he is still serviceable and could surprise evryone next year with “a new lease on life”. Who knows, I certainly don’t. Apparently, “the experts” think he’ll end up in New Orleans, New England, Pittsburgh, or Indianapolis(doubt it). We shall see. BOOTTOM LINE: THANK YOU FROM THE BOTTOM OF OUR HEARTS LT! This means we need a running back now. I’ve heard we’re interested in Lendale White. That could be interesting in combination with Sproles. I like LaGarrette Blount if we can get him in the 3rd round… he’s the guy who knocked out the Boise State player in the beginning of the year and got suspended for most of his senior year. At 6’2 / 240LBS, he’s a force with which to be reckoned. Previous PostReggie’s Kids and Scott’s Totts Have Something in Common!Next PostWhy Not Sproles?